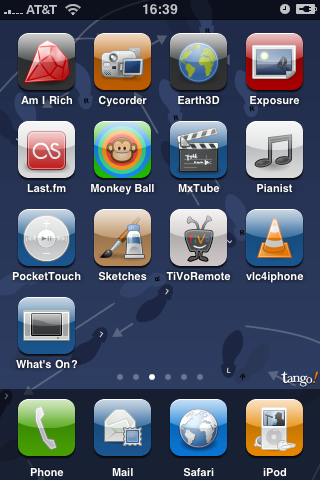 This is a WinterBoard theme for the iPhone and iPod touch that uses Tango-style icons. These require The GIMP and include a wealth of standalone icons and SVGs that form the basis of this theme. See below for credits. Download iTango and extract it. Select iTango, exit, and wait for it to respring. * If you’re on a Unix-like platform (e.g. OS X, Linux) with SSH, rsync, and Python 2.4 or later, you can just run install.py <your phone's IP address> in lieu of step 2. This will also restart the SpringBoard in case you’re upgrading iTango. Most of these icons come from a custom Gnome icon theme based on Foxtrot created with Tango Generator, but the real credit for a lot of them goes to the Tango Desktop Project. PenguinPanic’s icon comes from Crystal SVG, and TiVoRemote’s icon comes from hicolor’s icon for gnome-lirc-properties. I created the PocketTouch icon from the iPod icon from the Foxtrot-based theme. The icons for Twitter clients are based on the Pidgin icon. Most of the icon backgrounds were made by me. The source files are based from Jotlet’s PSD file from their blog a long time ago, but I have replaced almost everything in it, so only a few background layers are even based on theirs. The glossy overlay, shadow, and layer mask all come from the PNGs that MobileSafari uses to make Web clips, and credit for them goes to Apple. The wallpaper comes from here and is released under a Creative Commons Attribution-ShareAlike license. Tango icons are © Tango Desktop Project and are released under the Creative Commons Attribution Share-Alike license. Be sure to update WinterBoard and undo MobileCal plist patches for best results!!!!! Changed theme folder back to just iTango to be consistent with the Planet-iPhones package. An F***ING NDA icon can be found under the Dev folder in the source package as fing_nda.png.